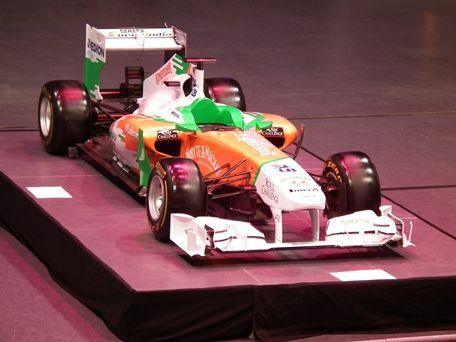 Celebrating the strength of the motorsport industry in Northamptonshire, Northampton Borough Council and Royal & Derngate have teamed up to bring a Sahara Force India Formula 1 car to display in town in the week running up to the British Grand Prix at Silverstone. Based at Silverstone, the Sahara Force India team are riding high, after enjoying their strongest performance of the year at the recent Valencia Grand Prix, with Nico Hulkenberg and Paul Di Resta taking fifth and seventh place respectively earning the team 16 world championship points. As they look ahead to the British Grand Prix, they are giving the people of Northampton the chance to see one of their Formula 1 cars up close, when it takes pride of place in the theatre’s Derngate auditorium from Monday 2 to Friday 6 July. Showing the versatility of the auditorium, with stalls seating removed to transform it into its half-flat floor format – one of the many possible configurations of the space – the car will be on display from 1pm till 5pm on Monday and from 10am till 5pm from Tuesday to Friday. Members of the public can view the car, free of charge, and get their photos taken in front of it, and more information about car and its drivers will be available. The 2012 Formula 1 Santander British Grand Prix comes to Silverstone from Friday 6 to Sunday 8 July. For more information about Royal & Derngate, please contact Amanda Howson on 01604 655719 or email [email protected].